England, 1942. Sqn/Ldr Don Andrews, the CO of No. 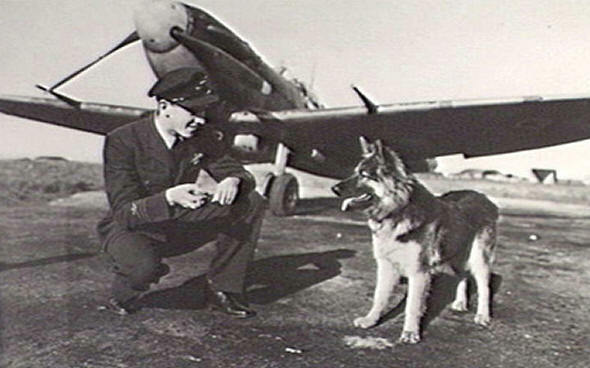 453 Squadron RAAF, pictured with his dog, named Sprog. Don Andrews is one of the Australians who, sent to England, made their mark by flying as fighter pilots against the Luftwaffe. Like many fighter pilots of his generation, he looks upon his wartime career with modesty. When I met him, he opened the conversation with a comment that he had a charmed life always in the right place to get promoted or the best jobs. Perhaps an understatement in light of the times he had while combating in the skies over Europe. Don was born a Queenslander on September 5th, 1921. Having reached 19 and with news of war raging in Europe, he enlisted on the 8th November 1940 and soon found himself at Bradfield Park, New South Wales and was then shunted off to Narranderra where he learned to fly Tiger Moths. In no time he was on a ship bound for Canada and found himself at Camp Borden, Ontario. He was destined originally for twin engine aircraft training school but was given the opportunity of volunteering for single engine aircraft. Don was granted his Wings and commissioned at SFTS (Service Flying Training School) where he flew Harvards and Yales. He was then shipped off and bound for England via Iceland and arrived at Llandow (Wales) where the Station Commander was GPCPT Taffy Jones. 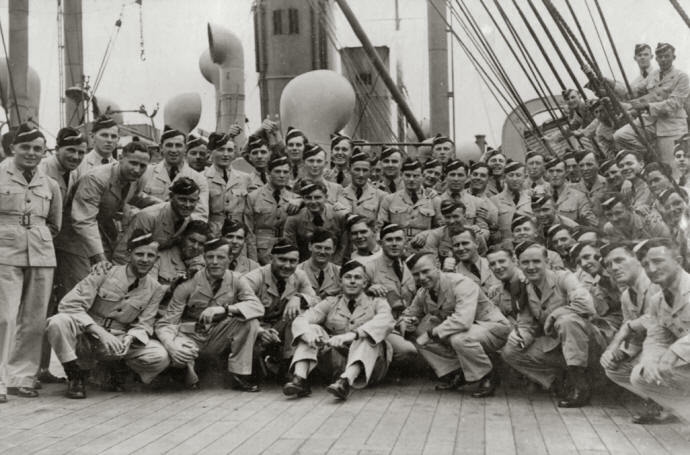 The Boys being shipped off to England – Don back row third from left. Short of instructors he was given the opportunity of serving as an instructor for one term and then could be granted any Squadron he would like to go to. After his term as instructor he was granted his wish and ended up in 615 Squadron, flying Hurricanes. He was then posted to Manston in Kent and thence to Wales, close to where the famous RAAF No 10 Squadron (Sunderlands) was based. He was then moved on to Middle Wallop aerodrome, a night fighter base, as a pilot on Hurricanes in 245 Squadron. He enjoyed his stay there and Don as an aside mentioned, “ I was always keen on flying even as a kid and used to sit in a tree and pretend I was a pilot”. He certainly got his wish. Don was promoted to Flight Commander 175 Squadron (Hurricanes) and was involved in dropping bombs on coastal shipping and even took part in the Dieppe Operation. The shipping was usually non military but well supported by armed escorts with plenty of flack. These Axis ships were mainly cargo steaming up and down the Channel. Later he was to join No. 453 Squadron as Flight Commander, where he was to replace Bobby Yarra. Yarra had recently returned from Malta and was shot down and killed in action off the coast of Holland whilst on 10 December 1942. Don said that Bobby Yarra’s younger brother later came to the Squadron and he also lost his life on operations (P/O Bob Yarra was also killed whilst on operations on 14 April 1944, during dive-bombing operation against a V1 site near Abbeville, France – Ed.). In time, Don moved from Warmwell to Southend. He and sixteen Hurricanes, some carrying bombs, were involved in the support of bombers such as Mitchells, Liberators and Fortresses mainly over enemy held France. 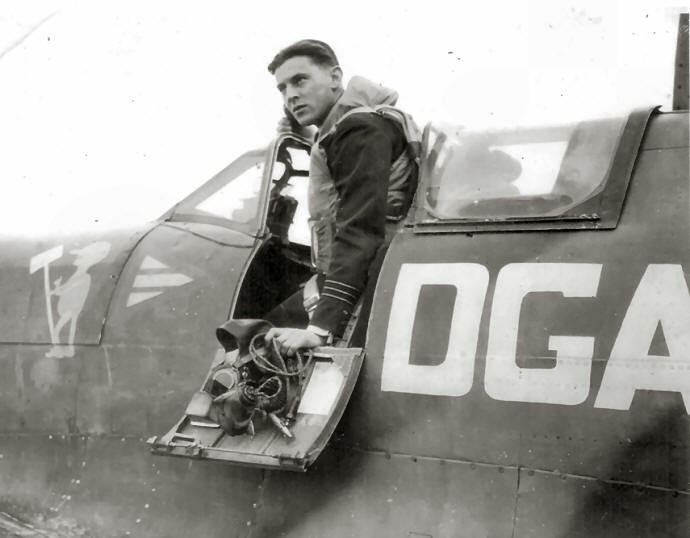 He was loath to speak about too many of his scrapes but did mention that on one occasion he was separated from his Squadron and was jumped by six enemy aircraft. He got peppered but managed to bring down one of the enemy planes. Don said that, “It all happened so fast but I claimed one of the Fw 190’s and received the DFC for this action”. Operating from Perranporth in Cornwall, 453 Squadron, Don as a Squadron Leader was leading 7 Spitfires on an offensive sweep near Brest, France when the Squadron achieved it greatest single victory. They had almost reached their turning point at 8.30 am, when 8 Me110’s were seen in formation low on the water. As the Spits dived to intercept the enemy scattered but were easily brought to combat and 5 were shot down, 2 by F/O Pat McDade, 2 by P/O Rusty Leith and one by Russ Ewins. Soon afterwards engine trouble forced Russ Ewins to bale out over the sea. About an hour later 2 Spitfires flew around about 5 miles to the South and one was piloted by Don and the other one by Ross Curry. They pin-pointed where Russ was splashing around and luckily for him he was soon rescued. Don as flight commander of No. 453 Squadron RAAF, in the cockpit of his Spitfire Mk. IXC marked FU-?. Don was to also serve in operations against the V1 ad V2 sites in France. He said that there was not a lot of troublesome AA as he was flying a Spitfire which was manoeuvrable and could avoid a lot of incoming fire but he was very sorry for the boys in Bomber Command who took some losses. On the Spitfires Don and his Squadron sometimes carried bomb loads which consisted of high explosives 1X 500 lb and or 2X 250 lb bombs. Don ruefully said, “If your bombs did not release over the target you had to bring them back home then you had to land with them and much faster than you would wish and make sure it was as smooth a landing as possible”. He moved from a small grass aerodrome called Southend to Hornchurch a very important field during the Battle of Britain. Then was moved on to his next posting to Ibsley and was later stationed at Perranporth. Kell Barclay the CO was posted back to Australia and Don was promoted to Squadron Leader and became the Squadron Commander. Later the Squadron was transferred to Skeabrae in the Orkneys Islands for rest. They rested alright as the place averaged 60 mph winds and as a consequence they did not do a lot of flying over the 3 months they were there. As he was due for a rest having served in Operation flights of two and a half years in Fighter Command he was sent to Central Gunnery School as an instructor. In February 1945 he was back on operations at a small aerodrome, called Matlaske, and was attached and was to lead the Australian Wing (451 and 453 Squadrons) as Wing Commander. In April 1945 Don found himself in Lympne, Kent and was living in luxury there with his own quarters. The War was soon to finish and after staying in England for awhile he was shipped back to Australia and eventually made his way back home to his family in Southport, Queensland. 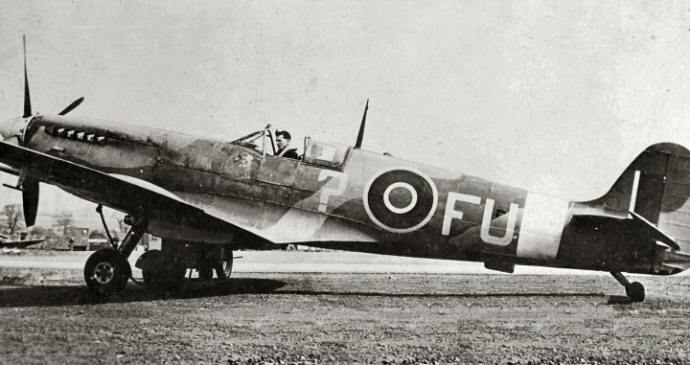 When questioned Don said that he preferred flying Spitfires as he considered them vice free whereas by the later years of the war the Hurricanes had been superseded. He also flew Mustangs which he thought were marvellous but heavier to manoeuvre and more solid than a Spitfire. He even tried out a Thunderbolt (nicknamed the Jug) and found them also very comfortable. Other aircraft flown were Vultee Vengeances and Tempests. Don had one victory, 1 probable and several damaged. He was discharged 5/4/1946. Don Andrews was to resume quieter civilian life and rejoined the Commonwealth Bank of Australia eventually retiring in October 1983. This article is reproduced by kind permission of The Spitfire Association, www.spitfireassociation.com.au. I have just bought a Mk Vc Spitfire, number EE602, which Don flew from Ibsley in 1943. I’m having her restored to full flying order so I am sure Don would like to know. I’m also part of an historical group restoring the old Ibsley control tower. If you can put me in touch with Don or his family I would be very grateful.